Blogging tips to find the widget id of any blogger gadget you add through ADD A GADGET option in blogger to customize it. A simple trick for how to find the widget id of any gadget. 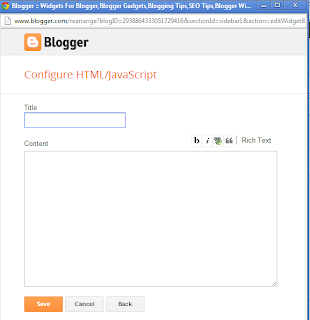 You may have noticed that some of the blogger gadgets that you add in blogger does not look professional so you need to customize those blogger gadgets or blogger widgets which matches with your blogger template and blogger theme. So here is a simple blogger trick to find the widget id of any blogger gadget. You need to find the widget id of any blog to customize it. If you are able to find it you can customize any of your blogger gadget according to your desire design that matches with your blogger template. To find the widget ID on any of blogger gadget. Follow instructions below. Now Suppose you have chosen the gadget and now the next step that you have to do is maximize it. When you maximize it then see the menu bar end. In the right side. Here you can see the widget ID named as HTML7. This is the ID of your widget. Using this widget id you can customize any gadget on your blog. If you like the blogging tips to find the widget id of any blog. Feel free to comment and share. Description : Blogging tips to find the widget id of any blogger gadget you add through ADD A GADGET option in blogger to customize it. A simple trick for how to find the widget id of any gadget.